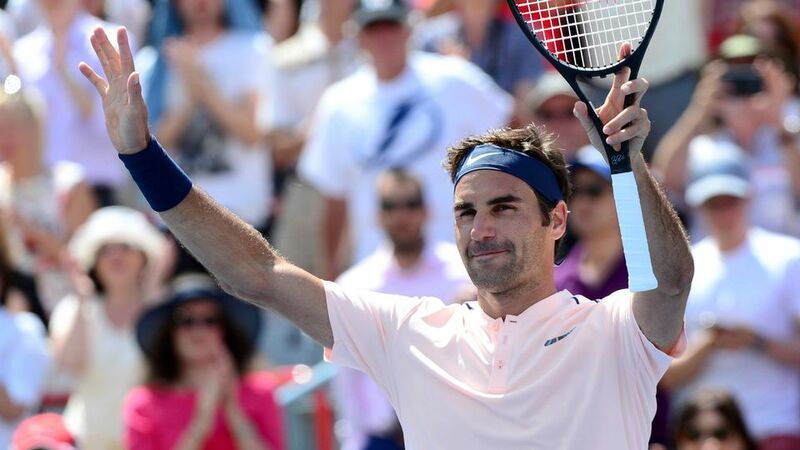 A brisk start to the US Open Series for Roger Federer at La Coupe Rogers as he routined Peter Polansky 6-2, 6-1 in 53 minutes in the opening match of the day in Montreal. Fresh off winning a record 8th Wimbledon the Swiss came into the encounter having just celebrated his 36th birthday a day earlier, but there was no hangover as he won 24 of 28 points behind his first serve and fired 26 winners en route to the win. Which also means he's now won 32 consecutive sets since losing to Haas in Stuttgart! Polansky won the toss and elected to receive. Roger held to 15 for 1-0, and a double fault from Polansky on his opening service point set the tone. The Canadian went on to be broken to love, and Roger consolidated immediately for 3-0. Polansky got himself on the board in game four, but quick holds from Roger moved him up 5-2, and he broke for the second time to take the set in simple fashion. Into Set 2 and it was evident Polansky had no ideas on how to handle Federer's offence as he was broken for 2-0. A double break followed that put Roger 4-0 up and although Polansky had two break back points to get one of them back, he couldn't convert. In game six the wild card double faulted twice to help Roger hold a match point, which was saved along with a second to avoid the bagel. However, it made zero difference as the Swiss served it out to 15 to move into the Third Round. A very routine win here for Roger who looked in relatively good form in his first match back after Wimbledon. Looked to be moving ok, served nicely and volleyed well winning 18 of 25 at the net. All solid numbers but still early days here with a tougher test coming in the shape of Ferrer or Sock in the next round. Easy opener for Roger who was on top from the get go and overpowered his Polansky to cruise through in under an hour. Ah were you there live? Is hard to tell on TV, looked windy. Del Potro is playing tennis at the same speed he walks in between points, no form at all from him. Nice to see Fed coming in to net a lot. As for the match: I didn’t watch it, but it seems that the highlights are just about all there was to it!.. I want to support for musical guidance. Rui, give suggestions! – As for the highlights that’s too few shown. Roger made many more cheeky ones. Haha yeah I’m not really a Coldplay fan. The odd song is good as background easy listening but to listen ongoing? Not for me. Not even sure what I’d class them as now? Indie when they burst onto the scene, but just gone down the bland dance reinvention. Like that Chainsmokers song – it’s listenable on Spotify when it comes on, but nothing to do with Coldplay really, just a generic dance tune. I used to be a coldplay fan like 10 years ago, now for me it’s just like you said, generic dance stuff ? I’m a little surprised Polansky even made it to break point – did Roger start putting it into the net and doing it to himself? At least Polansky was chasing some balls down in the second set – in the first there seemed to be several balls he didn’t even move for. Kind of a blink and you missed it match. Can’t remember what happened in that game, was a few unforced errors I think. He had no idea where Fed was going most of the time, just a bystander at the back of the court. The interview Susie posted below is good, like he said he’s used to playing grinders week in week out where you can hit 10 balls then actually start the point. Here he got 1 shot to make an impact. Guess it’s like anything if you never face that style then very hard to get to grips with in such a short match. Remember when I went on a bowling machine once and cranked it up over 80mph, don’t think I saw the first 6 balls, but after a while it got much easier to face. There’s a typo in the statistics table – Federer’s net points won are shown as 18/125 instead of 18/25. Bearderer on a rollerer. Gear lookin good. Wonder if Shapovalov will take out Nadal? Gretzky turning into a groupie? Some good wins for Shapo but looked like Nadal dismissed Coric so can’t see him scoring another scalp. Wrist, I think, for Rao? Ah didn’t know he had injury, just thought he was clowning up. Huge win for Shap, never saw that coming. Yeah I can’t see Ferrer posing too many problems, had to grind it out vs. Sock and not really the player he was. Although he’s definitely picked up a bit in recent weeks. Looks like a guy who needs to practice v. hard to keep his level high and injuries derailed that. Nicely summed up by Peter himself! Yeah he had no time to settle, looked flustered from the word go. Least he avoided the bagel. 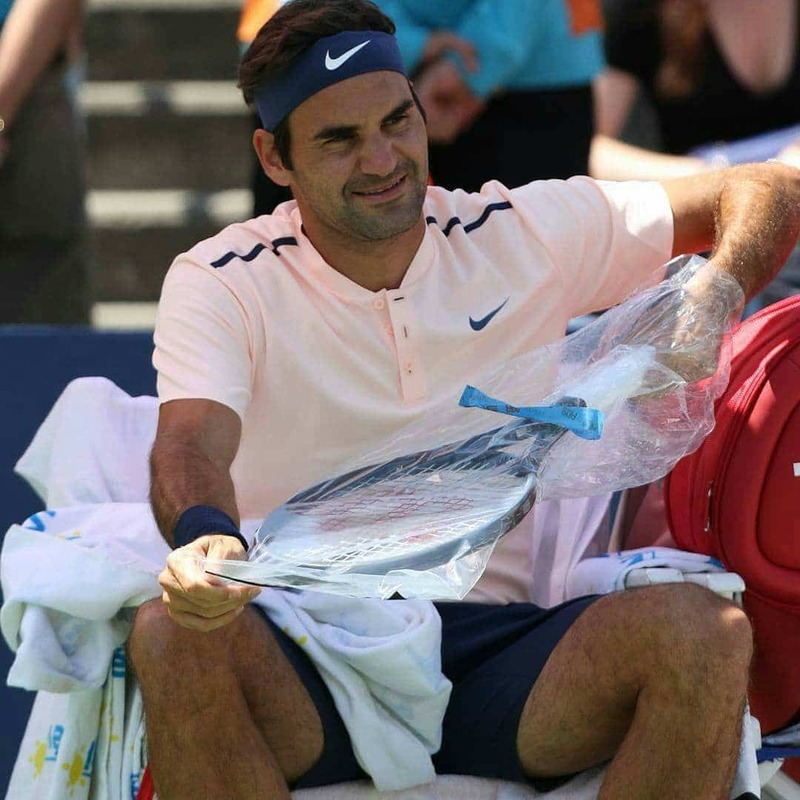 Hey guys, Roger looking very good in baby pink. But just like I said to Jon and Dippy… he looks a bit chubby. Chocolate tummy 🙂 But you earned it Goat. 2 GS this year…. you are allowed to go on a eating role. Maybe he’s been snacking on Poutine over there. The Canadian guy got Polansked totally. Soon a Spaniard is gonna get Ferrerred. As for the other Spaniard, I hope Fed doesn’t get to meet him. Not that Fed won’t whup him but do not want Rafa to reach the semis itself and take the No 1 ranking. Somehow it looks so ridiculous that a player who has won one GS and lost three times to the player who has won 2 GS in the year gets to No 1. Doesn’t deserve it at all. Nadal has been the second best player of the year though, and best on clay. So not a fluke if he gets it. Fed did skip the clay season, so can’t have too many complaints. Nobody else in the running other than those two. The thing is, I’m not sure I agree with that argument. For years, we’ve gone back on the H2H argument by saying Fed plays Nadal too much on clay, and berated Nadal because he was never good enough to get to latter stages on other surfaces. The reality of it is, Fed has posted the best level this year, because he’s won 2 majors. But he chose to skip the clay season. It’s not like clay doesn’t exist – if Nadal accrues a lot of points there, you could say Federer has failed to turn up, the same as if he were injured. I guess my point is, there’s not a whole lot of difference between 2 major wins and 1 major win/1 major final – and the H2H is working for Fed because this time around he’s failed to advance far enough on clay to meet/lose to Nadal. Ultimately, I think the system rarely lies – people should be rewarded for (a) being fit enough or bothered enough to turn up at big tournaments and (b) reaching finals and latter stages despite not winning. Nadal has been the most consistent so far, and he’d deserve the ranking. I also think he will get it – but not for long. Good start a few a few weeks break, hard to tell if the surface is slow or medium pace. Conditions are a tad tricky though. Cmon Roger… lets do this!! Ferrer might win a slam in a parallel universe. Federer looked a bit out of sorts in the first set and a half but picked it up. Ferrer was playing decently too and Fed was missing a lot of routine shots and tossed in a few double faults too. Have to hand it to Shapovalov though, he survived a 12 deuce game in the 3rd set which is hard to do against Nadal. Just crushed forehands. It’s funny in a way to see Nadal have trouble against (real) lefties…he reverts to cross court forehands, but they were going right to Shap’s strength. That’s impressive from Shapo, didn’t expect him to back up the Del Po win. Doesn’t Nadal have a ridiculous record vs lefties though? Not sure he struggles. I didn’t see the Nadal match (too late) but from what I read : “Chapeau”-valov ! As for Fed against Ferrer, I found that Fed didn’t come that much to the net yesterday – so as to conclude points more rapidly. Is that because he somewhat feared Ferer’s precise passing shots or because he wanted to ‘test’ himself with longer rallies (thinking about future battles at the USO or even before) ? Or is it just simply because Ferrer’s game plan was better during the first 2 sets ? What do you think ? I think that would be an overanalysis. From what I saw, Federer simply didn’t turn up hitting the ball too well or too cleanly. Ferrer was returning well, so he forced a lot of shots with good depth, and that frustrated Federer, whose footwork was just a little off and was late to play a lot of shots. Later in the match, Fed found himself again (although he was still playing poorly and missing a lot), but discovered that Ferrer was retrieving incredibly well. I think Fed just got frustrated at slower conditions and how he wasn’t really making headway with 1-2 good shots, and had to hit more in a rally. I remember one particular game where he went for and missed the backhand down the line 3 times straight. Not crafted points, no space to hit in; he just stubbornly kept taking low percentage shots on. Just a bad day at the office, coupled with Roger losing his head just a little bit. To clarify, I think he realised he was gonna have to come forward because conditions weren’t playing fast enough and Ferrer wasn’t offering him much. Initially, I doubt it was in his mind, because he was simply under fire for the first few games. There’s zero chance he wanted to test himself with some longer rallies against Ferrer, this isn’t practice 😆 it’s third round of a big event. Conditions aren’t slow though by the looks of what Fed is saying. I had a feeling the court was going to be quick like Toronto last year, he says the same. Oke Roger…. don’t take the remaining guys too lightly…. as you can see with Rafa…. they have nothing to lose and they can play more freely…. I think this is now your tour/title to lose…. Hey there was a SABR there. Peter dubble faulted as Fed rushed to the net! !